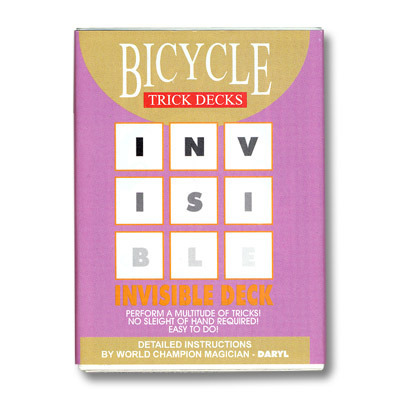 Today, when you order "Invisible Deck Blue", you'll instantly be emailed a Penguin Magic gift certificate. You can spend it on anything you like at Penguin, just like cash. Just complete your order as normal, and within seconds you'll get an email with your gift certificate. Imagine the pure performance power of this effect. You ask a spectator to think of any card in the deck. It really is a FREE CHOICE! You then remove an ordinary looking deck and show it to the spectator. After asking the spectator which card they thought of, you very fairly spread thru the deck to show that there is one card and one card only face down in the deck. The spectator pulls the card out to find that it is the exact same card they thought of only moments before! The Invisible Deck has been called the best card trick in the world. It's quick, easy and you get it right EVERY TIME! Watch the absolutely STUNNED look on your spectators faces when you blow them away with this one. Q: How long will it take me to master The Invisible Deck? A: Only about 15 minutes. Seriously, it's that easy and that powerful. An ingenious secret that will have people talking about you for a long time. 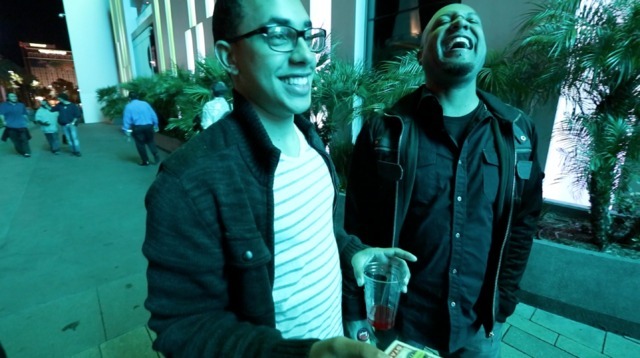 Possibly my favorite to perform and most commented card trick ever. You can learn how to perform this in just a few minutes, and you can be performing it years after you learn it. It packs small, after all it is a deck of cards, and it gives a HUGE response. I have been doing this trick for almost forty years and am still amazed by peoples response to it. 20 of 21 magicians found this helpful. You are stupid! I carry it everywhere, everywhere. It is the ultimate closer. 14 of 16 magicians found this helpful. When I was young I had a Brainwave deck. I still have it and like it, but the Invisible Deck is one step better. It is easy to follow the regular routine for this effect, and can be performed close-up for one person, or pumped up and performed on stage for one hundred people, and still have the same impact. Check out Joshua Jay's presentation on the DVD that comes with his book "Magic: the Complete Course" and you will see what I mean. That being said, I have two issues with this deck. First, when I got it the gimmick was a little too much, but after I practiced with the deck for a while it got easier. Now it seems to work just fine. Second, I was having trouble with the "cards down" presentation, but after I saw Joshua do the "cards up" version, that is the way I do it and it works great. It is not only easier to do, it is a more visually pleasing way to present the effect. Bottom line, if you do not own this deck you should get one. It belongs in everyone's bag o' tricks. Great effect. The product is high quality. Does wear out after awhile (maybe a year, not bad for 7.50) if you are using it, and you should be by golly. If your not sure, go ahead and buy it, you will not be disappointed. I ordered my invisible deck on Wednesday, and got it Friday with regular shipping-it was crazy. I don't know how that happened, but it was nice. As for the deck, it is great. Great trick, even better results and reactions. Every time I preform it, I get "wows". If you're on the edge of buying this like I was, definitely buy it, I'm glad I did. I remember when I first got my very first invisible deck. I opened it up, read through the instructions, and then started practicing. After maybe 20 minutes I got the idea down and I was put practicing it on my parents. To this day, I am still performing the invisible deck. There is no simpler effect. Rarely in Magic do we see a trick that does just what it says it will. This is one of those cases. The spectator can literally name any card, and you remove the deck, spread through, boom, there is the card face down. It's of course great quality because Bicycle makes it. I suggest this to anybody who is maybe 10 and up. It can be a little tricky but you get over it quick. It's realy good to trick your friends with! The will be very amazed! But don't do it to many times by the same person, because the wil find out! Good trick! BUY IT NOW! You can do this for any show street,stage or close up. watch your angels and take good care of it. and you can use this deck for years to come. This trick is easy, unexpensive, powerful, and the reactions are great! You can preform it after a few minutes of practise even if you are new to magic. I love it! A fabulous product, quality cards, amazing trick! Got astonishing reactions on my SECOND TIME PERFORMING THIS TRICK! Learned in 25 minutes!